Grand Rapids Civic Theatre and its School of Theatre Arts have combined on a special production for the inaugural American Association of Community Theatre's NewPlayFest. "The Boatwright," the story of a retired Kansas state trooper who decides to build a sailboat to single-handedly traverse the Atlantic Ocean and the troubled neighbor who helps him, is on stage through Sunday at the Grand Rapids Civic Theatre. Playing the lead roles are Patrick Hendren, who portrays 57-year-old Ben Calloway, and David Cobb, who portrays the troubled Jaime Watson. Hendren previously played Dr. John Watson in the Grand Rapids Civic Theatre's 2013 production "Sherlock Holmes! The Final Adventure," and was also in Circle Theatre's "I Don't Dress You for Dinner." 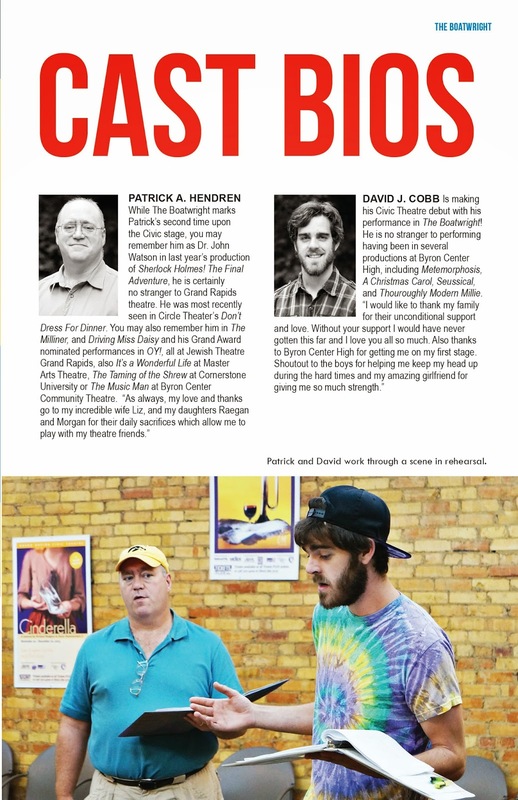 Cobb is making his Civic Theatre debut and previously appeared in several Byron Center High School Theatre productions. In "The Boatwright," authored by Virginia playwright Bo Wilson, two men -- Calloway and Watson -- are each working on defining a course for their future. While one's course clear, it leads to unknown destination; the other's course has a destination, but the chart is unknown. "The Boatwright" is the first play of the Civic Theatre’s 89th season. In celebration, Civic Theatre is offering a special $10 savings on tier one and tier two tickets for the production for listeners of Channel 95.7. Enter the code 89season when purchasing your tickets, which are regularly priced from $16 to $28 apiece. Show times for "The Boatwright" are 7:30 p.m. Wednesday through Saturday and 2 p.m. Sunday.